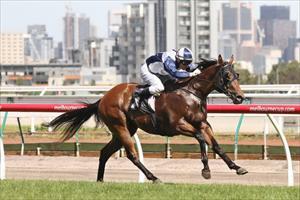 Emerging sprinter Adamantium returns from a long injury lay-off tomorrow at Moonee Valley and trainer Danny O'Brien is hoping to see the best of his talented galloper this campaign. It's been 235 days since the son of Elusive City lit up the Flemington straight with a devastating front-running win in the Group 3 Standish Handicap before a knee injury saw him miss the Autumn carnival. "It was disappointing that we missed the feature sprints in the Autumn, but the horse has come back bigger and better thanks to the break and we are expecting to see his best performances this season," O'Brien said. "He was super impressive down the the straight in past two races and I am hoping that with his injury worries behind him that he could take it to another level this preparation, time will tell." The five-year-old group winner has raced in black-type events almost his entire career and O'Brien is bouyed by a recent Flemington barrier trial. "I can't fault the horse and I am expecting to see a strong performance from him first-up tomorrow." Leading jockey Craig Newitt has ridden the horse at his past starts for two emphatic victories and their partnership rekindles in the 1000m listed event at the Valley tomorrow. "The horse has felt as good as he ever has and I am really looking forward to him getting back out there." Newitt said.